Do you want a Dáil dominated by Enda Kenny and independents?, ask the Green Party at today's photo op. Negative Campaigning - Single party government, anyone? At this rate there’ll be no friends left coming polling day. Fianna Fáil today issued SEVEN press releases attacking Fine Gael alone, while Fine Gael issued four attacking Fianna Fáil and one attacking Labour. Labour, meanwhile, issued just the one negative piece, merely criticising government policy on ghost estates. Changing tack - Fine Gael leader Enda Kenny this morning told Morning Ireland that the next government would need to “work with trade unions in the interest of getting our country back on track”. Not one, but two Fianna Fáil TDs quickly pounced: Seán Fleming and Thomas Byrne both noted that the Five Point Plan sees the party promise to “take on vested interests”, naming trade unions as one target. Chris Andrews: The Fianna Fáil candidate looks like an outside bet to retain his seat in Dublin South-East, so this evening tried to boost his profile by calling on the Dublin Docklands Development Authority to investigate claims the Carphone Warehouse is not being allowed to renegotiate its rent in the CHQ building. Only one problem… CHQ is in Dublin Central. Whoops. Charlie O’Connor: A Fianna Fáil clean sweep of Bad Days today. The Tallaght TD seeking re-election in Dublin South West got a smackdown from Fine Gael’s Simon Coveney when the former called for a cap on taxi licences – the only problem being that there’s one already in place. O’Connor was a “spoofer”, Coveney said. Ouch. Hot on the heels of Fine Gael’s personalised Valentine’s greetings unveiled on Sunday night, Labour has unveiled a tool where you can send a message to a friend, read personally by Eamon Gilmore, if you enter their first name, status and constituency. Unfortunately, though, it doesn’t recognise every single name one might type in. So, while friends named ‘Eamon’ will get a message beginning “Hello, Eamon”, there are no similar recordings for the names ‘Enda’, ‘Micheál’ or ‘Gerry’. We therefore haphazardly guess that Labour only wants coalition with ‘John’ Gormley of the Greens. All three of the main party leaders will spend tomorrow off the buses (mostly, anyway) and will actually canvas in their home constituencies. The Green Party launched its party political broadcast today, and took the opportunity to channel the ghost of Michael McDowell and warn of the dangers of a government propped up by independents. 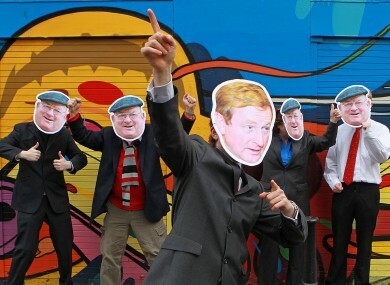 A photograph included in the press release showed a number possible high-profile independently-minded candidates who stand a chance of election – with each of them wearing familiar headgear.